Do some of these and treat your business more like a salaried job. Most people have had a salaried job at some stage in their life, it might have been a long, long time ago, but if we think back to that, to become more productive and more successful in our business then some of these things might be really, really helpful. So let’s see. So the first thing is to have proper starting and finishing times. If you drift down into your office or onto your kitchen table with the laptop at whatever time you fancy, and you stop when it gets dark or when you’re hungry, and you don’t even notice the time. Or you’re distracted by lots of other different things like personal phone calls, then it’s not very helpful I find. If you have fixed starting and finishing times – I know every day can be different as a business owner – but maybe you can say Monday, Wednesday and Friday, I’m going to start at 8 and finish at 2 – that can be really helpful to your productivity and to your success. Next point I’d like to talk about is, like I touched on just now, do productive work while within these fixed working times. Don’t do the housework or errands or chat with friends on the phone or private Facebooking and all that kind of stuff. Tell people if you need to, that you’re working between this time and this time, and they can reach you afterwards. Or say “Hey, I’m just in the middle of something, I’ll get back to you.” Or just switch your phone off completely and just not be available. People will soon learn that, although you might be working at home, you’re not actually available all the time. Do the productive work in your business during that time. Also, another important thing is, you know when you have a salaried job there used to be fixed break times. So have your cup of tea at 10, and have your lunch at 1. This way you can have a breather, you can stretch your shoulders, move them around; I know mine get really, really stiff, so that’s another thing you could do, integrate the breaks into your working time. Obviously being a business owner and entrepreneur, you might have very different schedules each day, different things that you do. But you know, if you schedule in a lunch break, then you’ll actually take it and you won’t be starving and then stuff your face in the evening. If you fuel your body correctly throughout the day, then that will be really helpful to your productivity. Another thing that’s really, really good, is a lot of people do this in their salaried jobs, before they leave, in the evening, they write a to-do list of all the things that they need to do the next day. I suggest you do that at nighttime before you go to bed so that you can get stuff out if you need anything to prepare for the following day, before you leave the house in a rush and forget half of it. You can write a list and say “Ooh yeah, I need that document, and I need to print that out.” So you can get prepared the night before, that can really, really help you. You could also it in the morning but that’s only if you get up before everybody else, and you have enough time to get stuff out if you need additional documents. So another thing that people do in salaried jobs that’ll be really helpful in your business is to update your digital and paper calendars immediately on booking our appointments. Check both, either the night before or first thing in the morning, so that you’re not double-booked, and you don’t miss an appointment. I mean, that would be fatal for your business if you did. Your reputation and your reliability would be straight down the pan if you did that. So update everything immediately, and make that your priority as soon as you make an appointment. I have a Filofax and I put it straight in there. And I put it in Google Calendar too. If it’s an appointment that clients have made themselves on my Acuity scheduling, then it will immediately integrate with my Google calendar. That mean that it goes into my Google calendar too, and I get notifications there. So another thing to do that people in salaried jobs do that help them to be productive, is they create lists and standard operating procedures for tasks that you do regularly. No, write yourself an SOP quickly, you can write it down digitally, I use www.asana.com. I have a project in Asana called How To’s. I write a quick note in there and then I know where to find it. Or you can write it on a piece of paper and have a folder, especially with your SOP’s, your standard operating procedures. If you then, later on, employ somebody, like a virtual assistant or somebody like that, then you can just hand that over to them and they know exactly what to do and how you like it done. Perfect! You’ve thought about it, you’ve written down the procedure and you tweak it if it changes. But you don’t have to be overwhelmed every time you do something that might be seldom. You need to do it again and you’re “Oh, how did I do that again?” You’ve got a list, just look at it. Then another thing that could be quite handy, is to use a timer. I use the kitchen timer quite a lot for different activities. It’s best to do that with icky things like daily marketing, or writing emails to potential clients, or messages. And bookkeeping. That’s something that I admit I have to force myself to do. So I might set a timer and say, “Okay, I’ll print out all the invoices that need to go in this month’s folder for the bookkeeping”, or upload them if you’ve got a digital system, and that’ll keep you on task for the activities that you don’t really like to do. So if you think back to the times when you might have done a salaried job, or think about people who do salaried jobs that you know, is there anything else that might be helpful and that you used to do there? Add it to your list. You know, how were the processes? What did we used to do? What motivated us or what was something that was always top of the list at my job? What Would My “Boss” Want Me To Do First? And ask yourself too, what task or activity would a boss want me to do first and foremost, to create revenue? Because that’s the bottom line really, isn’t it? You want to create revenue in your business. It’s lovely tweaking your text on your website and creating a product, all that kind of stuff, but what activity would actually create revenue for you? Do that. And if you had a boss now, what would she expect you to do to create revenue? And then just go out and do it. 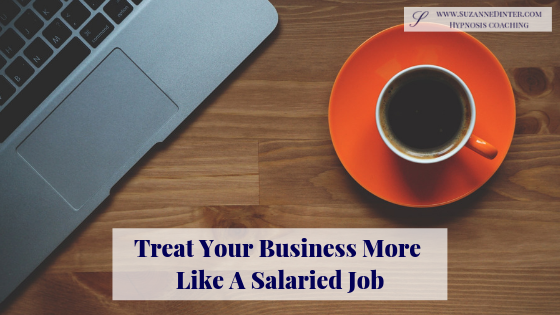 Treating your business more like a salaried job leads to consistency as well, which is also a key to success. I hope my tips today have helped you. If you have any ideas about anything else that I might have missed out or something that you remember from one of your salaried jobs, that’ll help you in your business. Or if one of my tips was helpful for you, maybe you’d like to leave a comment below. And if you’d like to explore why you’re not doing the important work to become successful, when you’re ready, please book a free consultation call. 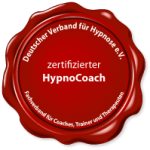 I have a special offer on at the moment of a full-length, tailor-made Taster Session for only €99. Click here for details and scroll down the page. Thank you for reading, that’s it for today and I’ll see you again soon.